Keeping your spine and nervous system healthy and functioning properly, without interference, is essential to maximizing your genetic capabilities. Simply speaking, here’s how it works: Your brain communicates with every cell, tissue, and organ of your body either directly or indirectly via your nervous system. Unfortunately, we don’t appreciate the importance of this system on our overall health until we hear of the tragedies of paralyzed people who sustained serious injuries to their spine. Not only did they lose function of their limbs, but their organs and systems began to malfunction, causing many other issues and disease within their body. Spinal injuries, known as subluxations, can cause server, long-term health consequences by reducing the function of your nervous system. 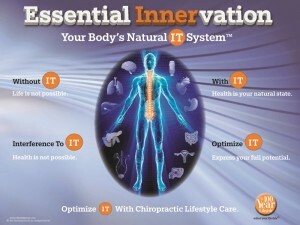 Chiropractic care will restore and revitalize the integrity of your nervous system, your Mind-Body connection, so you and your family can live and enjoy life to the fullest. While there is no guarantee that you and your family will never be sick or injured while under chiropractic care, you can be sure that with proper alignment and function of your spine and nervous system you will give yourselves the best opportunity to heal quickly and maximize your health. Chiropractic is safe, gentle and effective. Regardless of your age, you will look forward to, enjoy and value chiropractic care as an important part of a healthy lifestyle. Your health and your healing are your responsibility. What do you want your life to be like as you age? How about your kids? Sadly, hospitals and nursing homes are filled with too many people who waited for a health crisis before they committed to living a healthy lifestyle. If you or your family are being challenged with a sickness, or ‘dis-ease’, there is no better time than now to begin your chiropractic journey. If you have been blessed with a symptom and disease-free life and want to maximize your health and athletic performance, chiropractic care can get you there. Make living a healthy lifestyle your top priority and see why so many people have made chiropractors their family’s health care provider. Our team is committed to helping you and your loved ones live your best life every day of your life from birth to 80, 90 and 100 years (or more!). Make your appointment today. This article is provided by Cummins Chiropractic & Wellness your 100 Year Lifestyle Affiliate Chiropractor in Bellevue WA.